Below & left -Boardtrack racecourse - this was the track where the last bad accident occured. Afterwards the sport was done. Motor dromes have been around since the early 1900s. 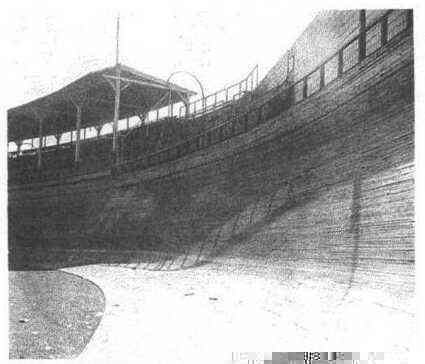 They were the natural evolution of the wooden board track motordromes (1 mi., 1&1/2 mi., etc.). They kept increasing the angle of the wall (making them more steep until they reached 68 degrees! ), which in turn increased the number of serious accidents. There had even been a track where the racing was advertised as, “Racing Neck & Neck with Death”! 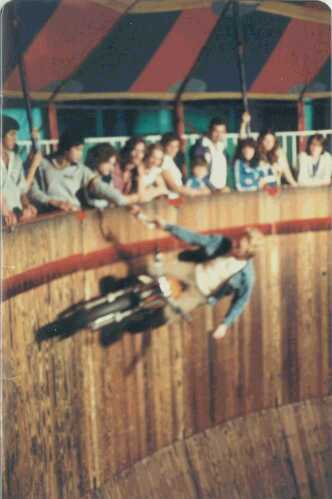 This led to the more familiar name, “wall of death”. 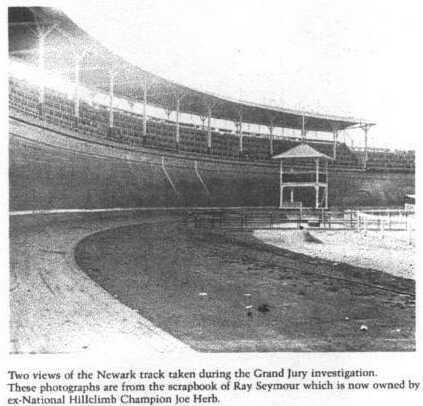 After a number of accidents in which many riders were killed or injured, and an accident in which not only some riders, but several spectators were killed, it was decided due to public outcry that the sport of boardwall racing had gotten too dangerous... and it ended. There were already some smaller, portable dromes in operation - but they were more like bowls than walls. The new ones that these riders flooded America with in this aftermath were 90 degrees straight up and down. In the first old pics, you can clearly see some of the same track riders with their bikes and trademark gear! You can see some of these pics on the “riders”pages. 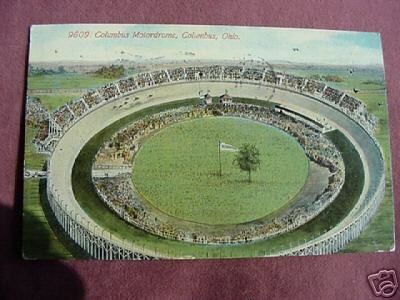 Aerial view of old boardtrack racetrack (mile). Below Sam’s old lion drome - called a “combination” style because of the 2 sets of walls (one on top of the other). 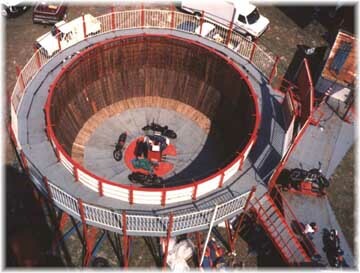 The single wall style is called a “silo” style drome. These are the portable wall styles that we know today. 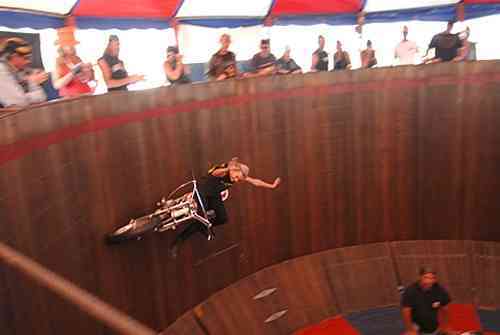 Russ Noel in Canada riding the old Lion Drome (notice the 2 sets of walls - one on top of the other).